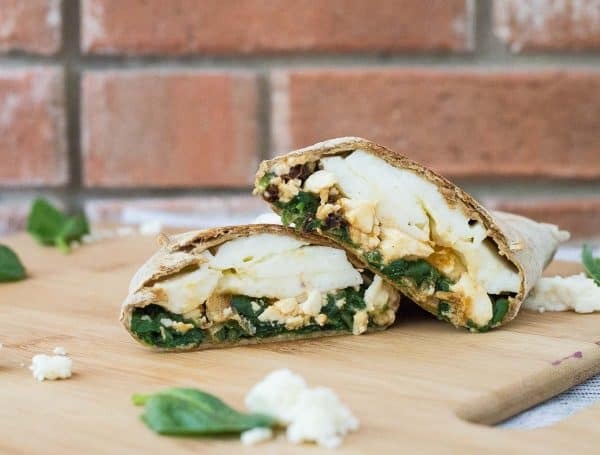 Make a copycat Starbucks Egg White Wrap with Spinach and Feta. So easy and you can’t beat the flavor! Filling and satisfying, it is the perfect breakfast. When I get the (very very very very) rare opportunity to work outside the house for a few hours to get writing and site administration type tasks checked off my to-do list, Starbucks is my number two choice of location. b) I want to work before 9…dang library opens too late. <— That’s what happened today. So if I land in Starbucks wanting breakfast, I get the biggest blonde roast they can offer me (black) and a spinach feta wrap. I’d say it’s due time I remake this sucker at home, right? Everyone is crazy (one way or another) over my copycat Panera macaroni and cheese or Panera’s squash soup. Time for Starbucks to get a little love. 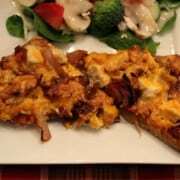 I teamed up with Flatout Flatbread again for this recipe and the wrap tastes identical. 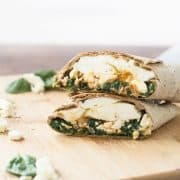 One of the great things about the Multi Grain wraps used in this recipe is that only have 100 calories but have 9 whopping grams of protein, just in the wrap itself even before you add the egg whites. So I did a little stalking research on Starbuck’s website and found that they use a cream cheese base on their wrap. I couldn’t find an identical product for this copycat Starbucks egg white wrap so I substituted with garden vegetable cream cheese (the best cream cheese on a toasted everything bagel, as a side note). A quick sauté of some spinach and sun-dried tomatoes goes right on top of the cream cheese, topped by feta of course and egg whites. I used the same pan for the spinach, the egg whites, and then to crisp up the wrap once it was assembled. This is going to come in handy when we move to our house in the middle of nowhere and have to drive 30 minutes to a Starbucks. Do you guys have a favorite Starbucks item? I’d love to recreate it! 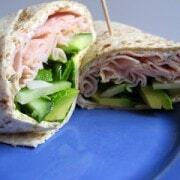 Watch this short video to see how to make this starbucks egg white wrap! In a small frying pan, heat 1/2 teaspoon olive oil with sun-dried tomatoes over medium-low heat. (If you have tomatoes packed in olive oil, you can skip this step and omit the olive oil). Cook, stirring frequently, until tomatoes are softened (3-4 minutes) . 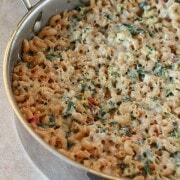 Add spinach and cover for 2-3 minutes or until spinach is wilted, stirring once or twice as needed. Carefully wipe out pan with paper towel (optional) and return to medium-low heat. Add egg whites, stir once and cover and cook for 4-5 minutes or until set. While the egg is cooking, spread wrap with cream cheese. 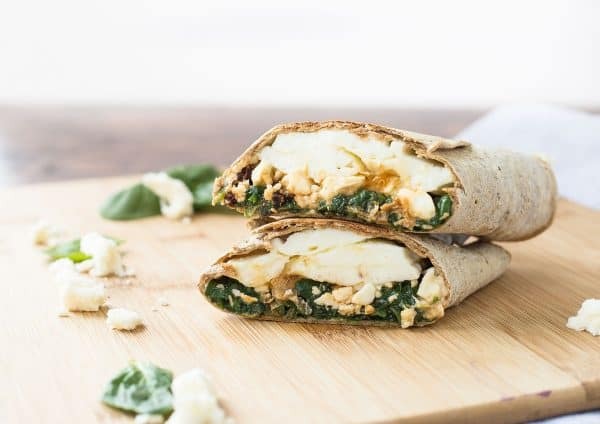 On top of cream cheese, layer on spinach and then feta. Once egg is cooked, place on top of feta cheese. Wrap tightly into a roll. If desired, return to dry pan (medium heat) to crisp outside of wrap. Start seam side down and flip after 2-3 minutes or until golden brown on each side. Cut in half and enjoy immediately. 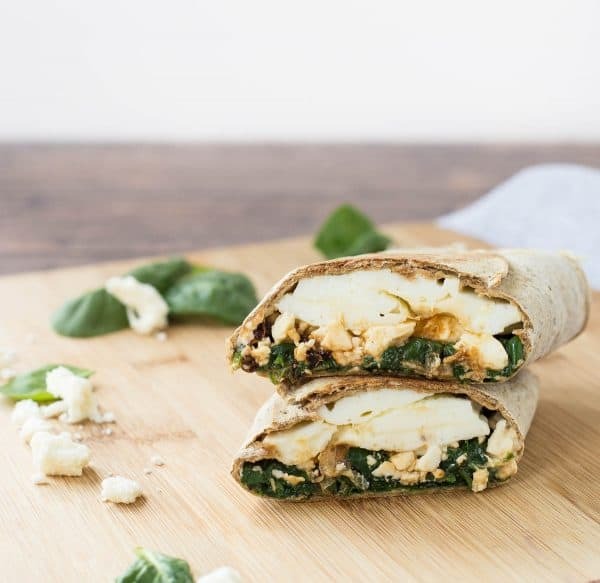 Verdict: Loved this copycat Starbucks egg white wrap – it’s definitely a good substitute if you’re looking to make a version of this healthy breakfast at home. Husband’s take: You guys must think I haven’t been feeding Ben because all of my “husband’s take” comments lately have been that he hasn’t tried the recipe. He’s been working at his new job for 8 weeks already so I had been flying solo temporarily. This turned out fantastic although I couldn’t find the Flat oubrand but I just used what I could find in the stores, I was too lazy to drive all over the place looking for that paricular item but I was able to buy the vegetable garden cream cheese but I didn’t buy the reduced fat one, I just bought the regular one. But it was EXTREMELY DELICIOUS despite this being my first time ever making it and my mom and dad absolutely loved it! My dad doesn’t always eat healthy foods so I was surprised that he actually ate it and finished it all and ended up feeling full. Oh I’m so happy to hear that! I’m glad you liked it. Thank you for taking the time to come back and leave a comment! Hmm…I must have done something wrong. I’ve never made egg whites before, so I accidentally got some yolks in it. I think that was problem 1. I think I should’ve drained my spinach and tomatoes too. I’ll try again. Sorry it didn’t turn out well for you….I hope it works great the next time! This would be perfect for lunches! Looks like lots of great flavors wrapped in it! Can’t wait to give this a try!!! I love that you did this! It looks better than Starbucks! I make a similar wrap and it’s our favorite for weekends! I can’t wait to try your recipe! Can you freeze these wraps to grab and go? In spite of the texture of the cheese changing ? I haven’t tested this recipe that way, but I think it would probably work. My only concern would be the wrap getting soggy since both egg whites and spinach have a fairly high water content. I’d blot the eggs dry with a paper towel before adding them and make sure to squeeze out all the liquid from the spinach. Let me know how it turns out if you try it! I’m so glad you liked it! Thanks for taking the time to come back and let me know! I have been using these flat out wraps since I first discovered them last year and I love them! I make a BLT wrap with 2 slices microwave bacon, crisp the bacon and chop it up. I seed and dice 1 Roma tomato, warm the wrap. Take a small avocado, smear 1/4 of it on the wrap (instead of mayonnaise), add a layer of arugula, put the diced tomato and bacon on top, roll it up and it’s delicious! Can these be made ahead and frozen? They look delicious! I haven’t tried that personally, but I think that would possibly work. My only concern would be that they might get soggy from the spinach and egg whites. I’d pat the cooked egg whites dry with paper towel and make sure the spinach is drained of any liquid. These look a hell of a lot better than what you get at Starbucks! Oh my goodness, these look wonderful. And I love that flatout wrap!!! Oh my gosh — YUM! Love all the protein! Perfect start to the day. You nailed it, these look incredible! This is my favorite breakfast “sandwich” out on the market right now! I’ve inly ever ate egg whites so it’s nice that more and more fast casual places are catering to the egg white only people! I also LOVE Flatout brand! I’ve been wanting to make this at home for a while–time to try! I LOVEEEE egg whites and feta and flatout! This is basically all my favorites in one healthy, breakfast. Totally gonna be eating this all week long!